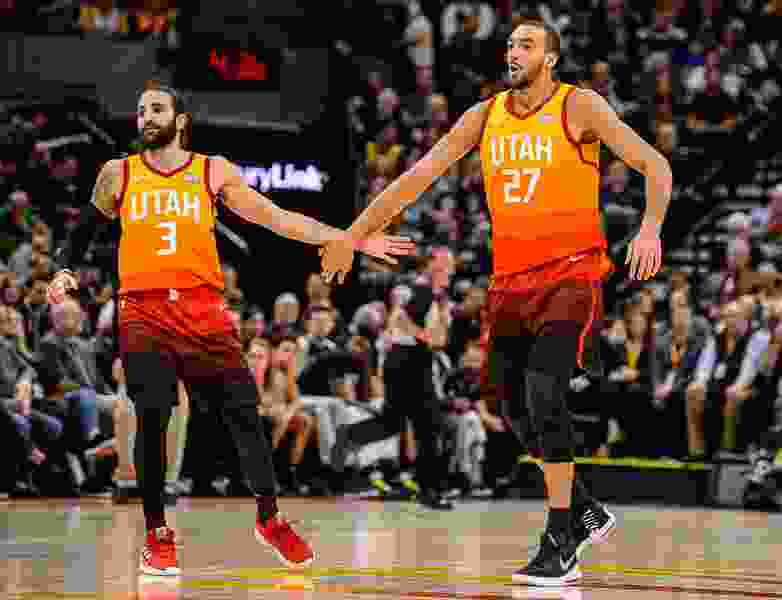 (Trent Nelson | The Salt Lake Tribune) Utah Jazz guard Ricky Rubio (3) and Utah Jazz center Rudy Gobert (27) high-five after a Gobert dunk as the Utah Jazz host the San Antonio Spurs, NBA basketball in Salt Lake City on Saturday Feb. 9, 2019. About the Jazz • Dante Exum is out due to a partially torn patellar tendon. … Grayson Allen has been assigned to the G League SLC Stars, who play their first-round matchup of the G League Playoffs against the Oklahoma City Blue on Tuesday. … The Jazz have have outrebounded teams by an average of 6.7 rebounds per game in the month of March. About the Suns • Tyler Johnson (sore knee), Kelly Oubre (thumb surgery) and T.J. Warren (sore ankle) are out. … Josh Jackson (sprained ankle) is questionable. … Suns signed former BYU guard Jimmer Fredette last week. … Fredette finished fourth in Chinese Basketball Association scoring this season (behind Pierre Jackson, Darius Adams, and Joe Young), averaging 36.0 points per game. … Fredette went scoreless in 4 minutes with the Suns in their last game vs. Sacramento.